‘Illegal’ PVCs possession: Court adjourns PDP chiefs’ arraignment till November 23 – Royal Times of Nigeria. The arraignment of three chieftains of the Peoples Democratic Party (APC) in Osun State, Alhaji Fatai Diekola, Sikiru Lawal and Adekilekun Segun, for alleged illegal possession of Permanent Voter’s Cards (PVCs) has been adjourned till November 23. 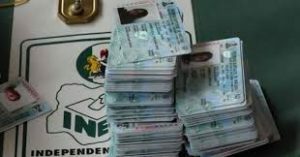 The trio were arrested on September 25 around Alekuwodu area of Osogbo, the Osun State capital, for allegedly being in possession of several PVCs ahead of the September 27 Osun governorship rerun. They were brought to court yesterday for trial. When the suspects were called into the dock, Oyedele (aka Diekola), who had a plaster on his hand, slumped before the charge against him was read. The accused was given a chair to sit on. The defence counsel, Bukola Onifade, told the court that the accused was seriously sick, adding that he was brought to court from the Obafemi Awolowo University (OAU) Teaching Hospital in Ile-Ife. The prosecutor, Felix Okocha, prayed the court to take the plea of the accused, but Chief Magistrate Olusegun Ayilara said he could not take the plea of a dying person. He adjourned the matter till November 23. Ngige says no pact on minimum wage yet, NLC kicks.